Modena area offers a lot of opportunities to all who want to enjoy it also by biking. Modena is one of the most interesting Italian cities for bike tourism. About 120 km of bike lanes have been built on some tracks of old railways or along the main local rivers (Panaro, Secchia e Tiepido). These routes, most of all with road signs, allow to ride across many round tracks of different length, in the most interesting places and away from the town traffic. 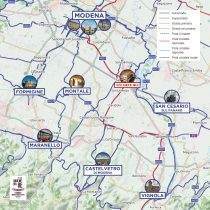 Among these different routes, we report the “Romanico in bicicletta” between Modena (with the Unesco site that includes the “Duomo”, the “Ghirlandina” and “Piazza Grande”) and Carpi; “Biciclette e Fiumi” between Modena and Finale Emilia that let you ride on the banks of the rivers Secchia and Panaro and the Bike lane built on the old Modena – Vignola railroad – that connects the “Via Emilia” to the Modena surrounding hills, crossing the lands of the Balsamic Vinegar, up to the Cherry Trees Valley and the hills of the “Grasparossa” red wine. And so? Are you ready to start and ride?!?! Book now your Weekend… we will think about the e-bike! … And for all who want to relax after cycling… our wellness center with Finnish sauna, Turkish bath, Kneipp path, tropical showers and Jacuzzis. For further information, route suggestions, assistance on tickets purchasing, don’t hesitate to contact us. Our staff will be at your disposal to answer all your questions and support you in all your needs. We can arrange half or full day guided tours.